Senior year was supposed to be great--that's what Ember's friend Maddie promised at the beginning of the year. Instead, Ember TrouvE spends the year drifting in and out of life like a ghost, haunted by her parents' recent, tragic death. At home, she pores over her secret obsession: pictures of missing kids-- from newspaper articles, from grocery store flyers-- that she's glued inside a spiral notebook. Like her, the people are lost. Like her, she discovers, they had been looking for a way to numb their pain when they disappeared. 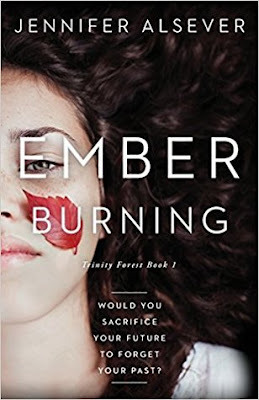 When Ember finds herself in Trinity Forest one day, a place locals stay away from at all costs, she befriends a group of teenagers who are out camping. Hanging out with them in the forest tainted with urban legends of witchcraft and strange disappearances, she has more fun than she can remember having. But something isn't right. The candy-covered wickedness she finds in Trinity proves to be a great escape, until she discovers she can never go home. Will Ember confront the truth behind her parents' death, or stay blissfully numb and lose herself to the forest forever? Modern day Alice in the Wonderland meets The Bridge to Terabithia. That is what I can sum Ember Burning up to. Its a coming of age, dealing with real life situations, one right after another. I really loved Ember's story and can't wait to see where Jennifer Alsever takes her readers next. This book is an emotional roller coaster but keeps you hooked right from the start. So much is at play here, Ember and Tre are lost and trying to find their way back. You can't help but want to get caught up in their story, you really want to hate Tre at first because of the way he comes off and Ember you just want to shake the crap out of her for the choices she makes. This is the first book, I have read by this author and I am excited to see where she takes her readers. Ember Burning was phenomenal.